This Luminox Men's Original Navy SEAL Dive Watch features a unique illumination system that glows 100 times brighter than other luminous watches, making it the perfect choice for low-light or non-light situations. This versatile timepiece is constructed with a polyurethane, 43-millimeter case. The durable polyurethane band is accompanied by a buckle clasp with safety mechanism. Stand-out Arabic numerals adorn the rich blue dial face. For further time-keeping practicality a handy date calendar rests at the three o'clock position. Powered by analog-quartz movement and water resistant up to a depth of 660 feet, this watch is preferred by US Navy SEALs and US Air Force Pilots. 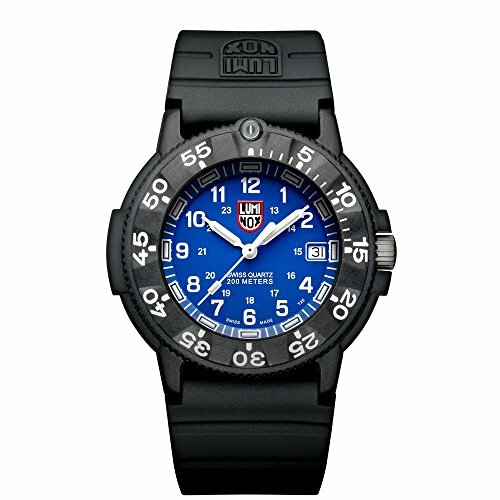 If you have any questions about this product by Luminox, contact us by completing and submitting the form below. If you are looking for a specif part number, please include it with your message.